,My husband got his green card after the long removal of conditions wait and his name was misspelled due to their mistake. We filled the I-90 electronically soon afterwards, November 1, and still haven't heard anything. This is the first time we have filed anything using the online form. 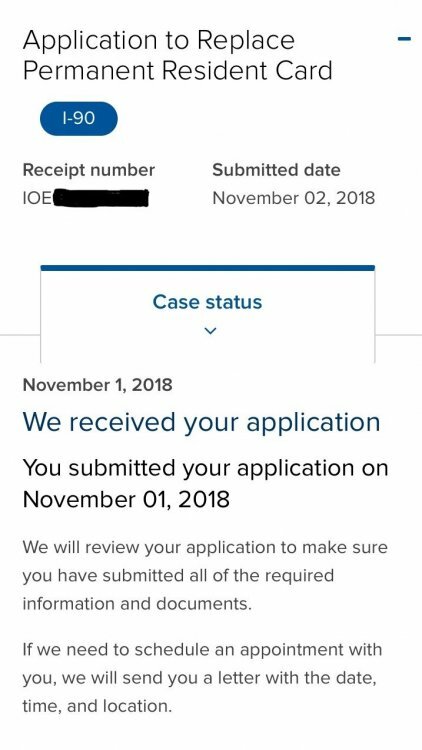 Just want to make sure the electronic form went through ok and the wait is on them, not something we have to do (see attached for what the website says about the case). Can he travel with the misspelled green card? We did go on a cruise with the misspelled card and things went ok, though at that time he still had a valid I-551 from earlier when we were waiting so long for the removal of conditions. We don't have travel plans yet but if we do, it would be by plane. I saw something about getting an expedite due to it being their fault, has anyone tried this? Since we are inside the country, are we stuck having to call the Contact Center? How bad is the error? Would it cause any issues with travel (i.e. doesn't match his passport)? His last name has two letters switched. For example, if his last name was Balboa, the green card says Balbao. His passport has the correct name so it wouldn't match. Oh that is a problem then. I would make an Infopass and request another I-551 as needed and explain that international travel requires all docs to have the exact same name, so the erroneous GC in question could cause issues.